What is Manhattan Bonsai return policy? How are shipping charges calculated and what do I do if a package arrives damaged? Q: Payment methods we accept? A: We accept all 4 major credit cards. Mastercard, Visa, American Express and Discover Card as well as debit cards which bear the Visa or Mastercard logo. Q: How does the shopping cart work? A: By clicking on 'Shop' and then 'My Shopping Cart' you'll be taken to your shopping cart. You may be asked to enter the e-mail address and password you supplied in the registration form. You will also be asked if you would like the server to write a cookie to your computer to automatically log you in on your next visit. As you browse through our online catalog, you can place items in your cart by selecting the 'Add to Cart' button from the product or search results page. Any special promotions, sale prices, and price breaks will be calculated in the cart, giving you an up-to-date subtotal of your order. To change quantities of the items in your shopping cart, simply enter the appropriate quantity in the QTY box and click 'Update'. To remove an item, you can click the blue 'Remove' button or use the 'Empty Cart' button to empty the entire shopping cart. When you are ready to proceed to the check-out process, click the 'Check Out' button. A: How does a Secure Site work? In plain English here's what happens when you place an order. First, you'll notice that you enter a secure site when a padlock icon appears in the status bar of your browser (usually at the bottom). This states that all of the information passed between your computer and our computer will be encrypted. Our computer will tell your computer how to encrypt all information passed between the two using encryption that can only be decoded on our server. Your computer will do such before sending any information onto the phone wire and out onto the Internet and eventually to our computer. When it reaches our server, it will be decoded and logged to our database for processing. Without the decoding key on our server, it is nearly impossible to decipher the encrypted data. Q: What is Manhattan Bonsai return policy? A: Manhattan Bonsai reserves the right to apply a 20% re-stocking charge (of order total) on orders that are packed but not sent, are refused, or are returned to us. For orders already shipped, the customer is responsible for all shipping charges plus the 20% restocking fee.You must notify us within 5 business days upon receiving your order if you are returning an item. 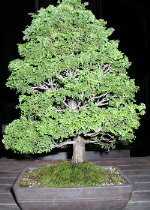 All sales on Bonsai trees and Pre Bonsai trees are final. A: Shipment of trees are shipped on Monday and Tuesday ONLY via Second Day Air or Next Day Air. All other items may be shipped anytime. The standard shipping times for orders shipped ground is 3 to 5 days If you still have further questions about your order, contact Customer Service at 914 309-5436. Q: How are the shipping charges calculated and what do I do if the package arrives damaged? A: Shipping charges vary according to Size, Weight and Destinations. All charges are calculated by UPS. We are not responsible for damage after delivering the order to the carrier (UPS). Our orders are packed carefully but occasionally the pottery arrives broken. If that happens, keep the packaging material and notify both UPS (1.800.PICK.UPS / 800.742.5877) and our customer service department of the damage immediately. UPS may choose to pickup the damaged goods for return to us. Once notified by you, UPS will contact our office and we will complete the claim. Failure to notify both UPS and Manhattan Bonsai may nullify your claim.